Garmin for Windows Mobile and Smartphones – For Land not Sea ! I have had emails from number of people saying that there are heaps of mobile chart plotters out there – but I beg to differ! 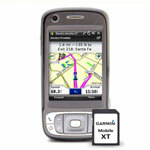 For example even Garmin only cover the Land ….Garmin Mobile XT transforms your GPS-enabled smartphone into a full-featured street navigator. Routing software and detailed mapping are preloaded on a microSD card – just plug it into your phone and you’re ready to navigate – on foot or in your car. With no subscription fee or additional equipment required, Mobile XT works anywhere, even outside your phone’s network coverage area. 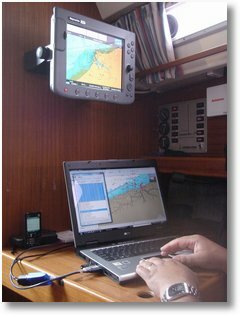 …so when will the Sea version come out – well …never me-thinks – why should they when they have so many solid and reliable handheld plotters already. It is the new entrants into the market that may be motivated to creep in via the backdoor of the smartphone devices. Not the incumbents like Raymarine or Garmin. Russ April 2nd, 2008| 2 comments - be the next!|Tags: Bluetooth - Garmin - Mobile Phones - Navigation.